People from across the world, with diverse backgrounds and from different fields, academics and non-academics alike; very inspiring and informative talks, presentations and posters, and fruitful discussions; a great venue and splendid weather. This was Tropentag 2014 in Prague. The Czech University of Life Sciences Prague hosted this year's International Conference on Research on Food Security, Natural Resource Management and Rural Development. MANY THANKS to the speakers and presentations, the participants and, of course, the organizers of this brilliant event! You cannot await next year’s Tropentag Conference either? Then don’t forget to note down next year’s venue: 16-18 Sept 2015 in Berlin, Germany. The conference will be held under the theme “Management of Land Use Systems for Enhanced Food Security – Conflicts, Controversies and Resolution”. See you there! 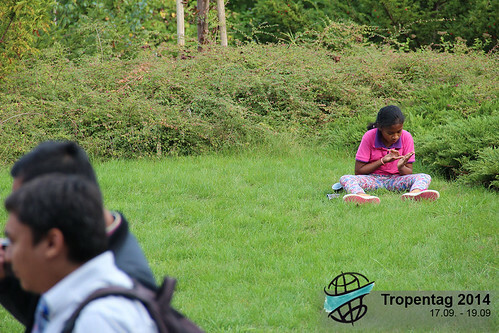 Answering big questions is natural to Tropentag, as the 20th edition of her prestigious interdisciplinary conference on tropical and subtropical agriculture kicked off today. 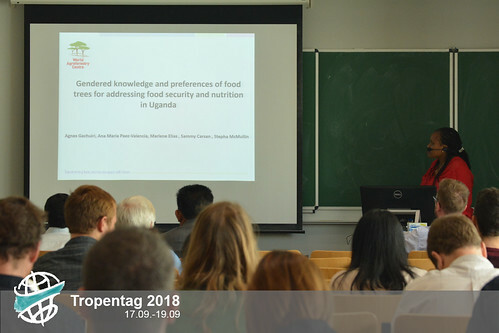 Intuitive biodiversity, mythical organic agriculture and the nexus between agriculture, nutrition and health were some of the questions answered by the keynote addresses in this year’s Tropentag. In attendance of this year's Tropentag is the oldest among all other participants, Dr. Rainer Zachmann, a retired German phytopathologist. Earlier on in his research life, he worked for the CIP from the years 1973-1989. With his passion for developing countries, he worked for IITA also as a phytopathologist from 1989 to where he was mobile throughout sub-Saharan African countries including Nigeria, Ghana, Togo, Benin, among others. Dr. Zachmann did not only work as a researcher in Africa but also availed himself as a trainer on all aspects of most valuable food crops in Africa such as maize, cassava, and yam. During this time, he developed research tours and conducted several workshops with the aim of improving agriculture in Africa. Dr. Zachmann spent close to a decade in Ibadan, Nigeria and due to his friendly manner he was fully integrated in his Nigerian community in Ibadan where he was named "Akinkanju" which literally means "warrior". During the oral presentation sessions earlier today at the AUD E2, Dr. Zachmann was the fifth to give a presentation. It was obvious that the audience were tired and bored already. In the quest to revive the tired audience, Dr. Zachmann greeted the audience in four different languages which then sparked inspiration in the audience. This indeed justified that there is a true hero in the house. It is not simple, as demonstrated in the third oral presentation session today. But the co-production and sharing of knowledge is an important approach to create awareness, improve social-economic conditions and find appropriate technologies in different places. The challenges and barriers are numerous, as Ms. Kristina Roesel from the International Livestock Research Institute in Kenya and Dr. Tom Bischof from the Zurich University of Applied Sciences emphasized on their presentations: long distances, difficulty of communication, poorness of infra-structures and cultural differences. All of these make the co-working of partnership of universities a complex task. But the benefits are undeniable, and successful cases like the e-learning platform offered by the Zurich University of Applied Sciences to the University of Lubjlana in Slovenia and the University of Agricultural Sciences in India, the RELOAD project from The University of Nairobi in partnership with University of Kassel (presented by Ms. Catherine Kunyianga) and the Mytox South, created at the University of Ghent between multiple universities in sub-Saharan Africa to reduce the risk of mycotoxins contamination in food (explained by Dr. Arnau Vidal from the University of Ghent). These programs show how it is possible to offer effective solutions to complex interdisciplinary problems. Ms. Camilla Adelle, from the University of Pretoria further unraveled the issues involved on trans-disciplinary research and production of knowledge, and the role of scientists on this mutual relation. During this afternoon's oral presentation session "soil and soil fertility", a presentation from the project Healthy Land with controversial research title " Do we need more drought for better nutrition? - Water stress on nutrient content of food" was observed. Sahrah Fischers PhD work became center stage for discussion prior to the oral presentation given by Mr. Thomas Hilger in the absence of Sarah Fisher at this year's Tropentag. With such a conrtroversial heading, it wasn't surprising that the AUD E4 was almost filled to capacity with attendants who have been driven to the auditorium to unmask the villain. Diving deeper into this research work, Mr. Hilger gave a clear introduction to this research by stating reasons why plants are important for human nutrition. Again, he pointed out clearly that with increasing extreme weather events, sudden drought periods can affect plant growth, bioavailability of nutrients and and quality of produced food. This then led to the aim of their study which was conducted in 2016 in two regions in East Africa (Kapchorwa, Uganda and Busia, Kenya) in order to identify whether drought have an impact on the nutrient composition of produced food. In Sierra Leone, Guinea and Liberia, the recent Ebola virus (EBOV) outbreak was devastating and led to more than 10,000 death. But who or what should we blame? - wild, domestic animals or both ...? That is the question Juliet Jabaty from Sierra Leone Agricultural Research Institute tries to find answers to. She agrees that bush animals such as bat and monkey are the major reservoir of EBOV but more animals could be culprit in cases reported. This critical research gap is yet to be filled hence Juliet researched on “The Role of Livestock and Wildlife in the Biology of Ebolaviruses”. She hypothesized that pigs, dogs and some ruminants can serve as reservoir for transmission of EBOV.